Iris Scanning: The Newest Addition to Apple's Biometric Roadmap? Over the course of the last several years, Apple has begun to take an intense interest in biometrics as a way to improve the security and accessibility of its devices. Apple purchased sensor company AuthenTec in 2012 and quickly incorporated its fingerprint-sensing technology into the Touch ID fingerprint scanner that debuted in the iPhone 5s. Touch ID marked Apple's first foray into biometrics, confirming user identity via fingerprint, but the company may have much bigger plans in mind for biometric sensors in future devices. Biometrics are said to play a key role in Apple's iWatch, and Apple may even expand beyond fingerprint technology, as the company has reportedly taken a new interest in iris scanning. While little is known about Apple's investigation into iris scanning, it is a promising biometric technology that's already widely used for identification and authentication purposes. Each person's iris, or the circular colored muscle of the eye, contains a complex and random pattern that is unique to each individual. Because the differences within irises can be seen from a short distance away, iris recognition can be accomplished by using a high-resolution camera that includes near-infrared light to highlight and capture the structure of the iris. Once an image (or video) is captured, algorithms can be used to identify the patterns within an iris to determine the identity of an individual. Because an iris is as unique as a fingerprint, it is a highly reliable method of determining identity. The chance of two individuals having the same iris pattern is 1 in 10 to the 78th power and because iris scanners deal with upwards of 2,000 data points (compared to approximately 100 in a fingerprint) an iris scan rarely results in false positives. During an initial iris scan, the eye is scanned and an encoded representation of the image is stored within a database. Later, when the eye is scanned again, the new encoding is compared to those in the database, verifying identity. Iris scanning is a newer technology than retina scanning, which required a bright light to illuminate a retina. Iris scanning, which uses both ambient light and near-infrared light, is less invasive. Currently, iris scanning is largely used for identity verification and has been adopted by several government agencies and major companies. 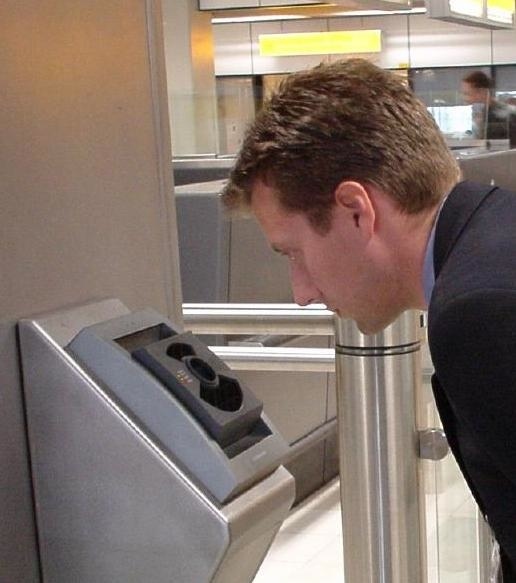 For example, at the Amsterdam Airport in Schiphol, iris scanning is used to allow passengers to cross the border without having to produce a passport. The United Arab Emirates has been successfully using IrisGuard iris scanning at border crossing points since 2001 and has lauded the technology for being both fast and accurate for identification purposes. Major technology companies, like Google, use iris scanning technology for security purposes. Google restricts entry to its data centers and its Google X labs via iris scanners. Bank of America also uses the technology at its corporate headquarters in North Carolina, with employees let into the building after an iris scan. Many companies are working on iris scanning technology and some important advancements have been made in recent years. For example, SRI International has developed an Iris on the Move Biometric Identification System that is able to read irises at a distance in many lighting conditions, even while subjects are moving. Another company, EyeLock, makes several iris scanning products for corporate and home use. EyeLock's recently debuted Myris is designed to be used at home with a computer as a way to replace traditional passwords. Earlier this year, a company called AOptix debuted the Stratus MX, a handheld iris scanner that fits over an iPhone 4/4s to capture both iris scans and fingerprint images, and IriTech has developed a way to incorporate an iris scanner into a smartphone using a single camera. Iris scanning is a function that could likely be built directly into the iPhone or iPad's front-facing camera. It is impossible to predict how Apple might utilize iris scanning, but based on other use cases, it is likely that such technology would be positioned as way to verify user identity, possibly replacing Touch ID. Like Touch ID, iris scanning could be used as a convenience measure, unlocking an iPhone when an individual's eye is successfully scanned. Iris scanning could also be used in conjunction with Touch ID, for two-factor authentication that could help Apple turn the convenience factor of Touch ID into a more secure feature that could be used beyond password replacement. Ultimately, Iris scanning has the same potential uses as Touch ID. Should Apple expand on its implementation of biometrics, both Touch ID and iris scanning could possibly be used as system-wide password replacement and to make purchases or payments (both online and in-store when combined with technology like iBeacons). While iris scanning and fingerprint scanning are both forms of biometric identification, iris scanning has some notable benefits. Unlike a fingerprint scanner, which requires physical contact with a device, an eye can be scanned from several feet away. A notable downside to Apple's Touch ID is that it cannot detect moist fingers, a problem that would be solved if no physical contact was necessary for authentication. Ridge patterns on fingerprints can also be affected by factors like cuts and dirt. In addition to being accurate, iris scanning is also fast. Current iris scanners used for the identification of multiple individuals can process 50 people per minute from multiple feet away as they walk at a normal pace. Apple's Touch ID can take several seconds to recognize a fingerprint, and it is likely that an iris scan would be both faster and more accurate as it can be done from a distance and while a person is in motion. As with any technology, there are drawbacks Apple would need to overcome to add iris scanning to its devices. Most scanners require decent lighting, and an iris scan can be affected by alcohol consumption and eye surgeries, such as the one performed for cataracts. 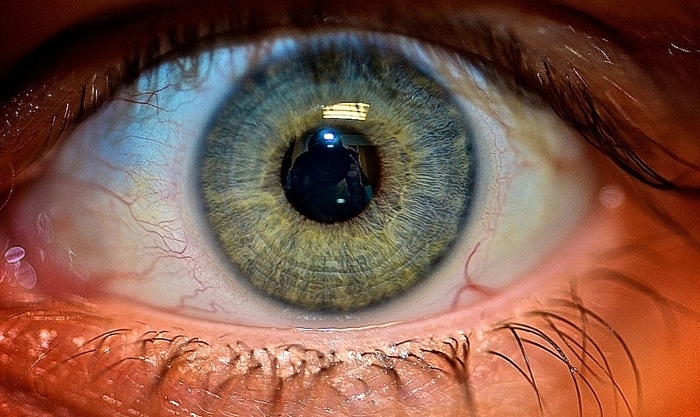 Iris scanners can also sometimes be fooled by high quality eye images, but some scanners can overcome this with a flash of light designed to make a pupil dilate. Public opinion is likely the biggest hurdle Apple will face should it implement iris scanning as a means of identification. The company faced scrutiny over the security and storage of Touch ID data and iris scanning could be an even bigger issue as it can be used covertly. 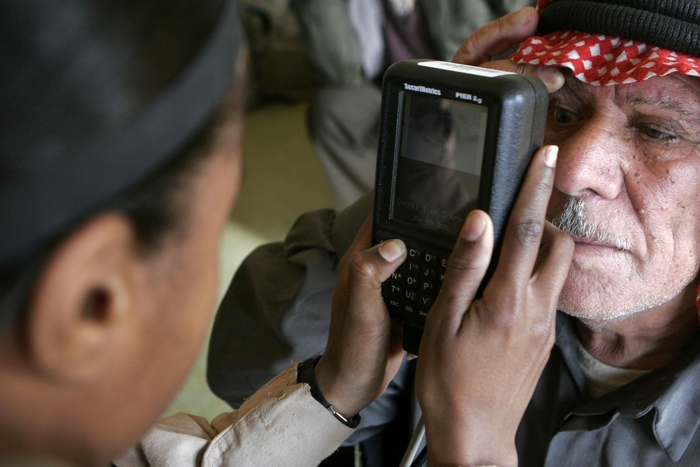 A portable iris scanner in use in Baghdad. Privacy concerns and infrastructure issues have prevented the Department of Homeland Security from installing iris scanners at U.S. airports and the American Civil Liberties Union has also raised concerns about eye-tracking technology, calling it a "privacy threat." According to Jay Stanley of the ACLU, iris scans are more of a threat than other biometrics because they can be acquired at a distance and without a subject's knowledge. In early January, Samsung EVP of Mobile Lee Young Hee revealed Samsung was investigating iris recognition technology for possible inclusion in the Galaxy S5, but recent rumors have suggested the Galaxy S5 will not come equipped with iris scanning, likely due to the fact that the technology is not yet ready for smartphones. According to a report from The Korea Herald, the technology that would allow iris scanning to be used in smartphones and other portable devices may still be a few years off. An iris scanning iPhone would likely require a higher-resolution front-facing camera that combines the current camera with the iris scanning ability and a near-infrared light. While such technology does exist, allowing a single camera to capture both iris scans and normal images, it remains in the prototype stage. Anthony Antolino, chief marketer at EyeLock, a major producer of current iris scanners, expects to see the company's technology embedded into smartphones, tablets, and PCs by 2015, replacing user names and passwords. If Apple plans to continue to pursue iris scanning for a future product, it is unlikely to be included in the next wave of device updates. Iris recognition does, however, appear to have a lot of potential as a technology suited to Apple devices as it could go a long way towards making iOS devices both simpler and more convenient to use. can apple stop scanning my body please? For some reason "Minority Report" comes to mind. Eye like the sound of this. at least this will help when you're drunk text. the phone would stay locked. Dear Apple, no thanks, sounds like a lousy idea. There has to be a good cornea-copia worth of puns for eyes. Wouldn't want to make a spectacle of it. I'm just not a pupil of the trade. iris is just siri backwards. Whoa. Wasn't expecting such a close up pic of an eyeball. "Current iris scanners used for the identification of multiple individuals can process 50 people per minute from multiple feet away as they walk at a normal pace."